Though the breweries are yet to be announced, expect to see many of the locals (Rahr & Sons, Peticolas, Deep Ellum, Martin House, Community etc. ), as well as the usual big national brands (Stone, Dogfish Head, New Belgium etc.). They may even surprise us with some of the new up-and-coming local breweries. One can only speculate to what beer they’ll bring, but they usually bring out the big brews for these festivals. My wish list includes: Peticolas’ 2nd Anniversary Imperial Stout deemed ‘Black Curtain’; any of Stone’s spicy pepper series in Crime, Punishment, or Southern Charred; if it’s out in time, Saint Arnold’s next beer in their Divine Reserve series; Prairie Ales, from Oklahoma, and their pepper Imperial Stout, Pirate Bomb! ; Jester King’s line up of exclusive sour beers, including just announced Ambrée sour amber ale; or Firestone Walker’s Russian Imperial Stout, Parabola, which is annually released in March. There should also be a wide variety of everyone’s Spring seasonal beers, which will most likely include several over-the-top hopped IPAs and easy drinking Kölsch and Saison ales. As usual, if you want access to the more rare and unique beers, make sure you get the VIP Beer Package, which gets you entrance to the festival at 3:00, instead of the usual 4:15. All beer packages include a tasting cup and twelve two-ounce samples. Tickets can also be purchased for just the concerts as well. The musical line up this year includes: The Joy Formidable, Allen Stone, The Felice Brothers, and Quaker City Night Hawks. 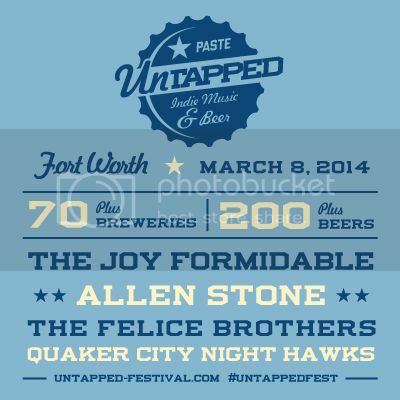 Plan for a great day of beer and music out in Fort Worth before the weather begins to heat up. Unless it already has. Actually, it might already be hot. Show up anyways.